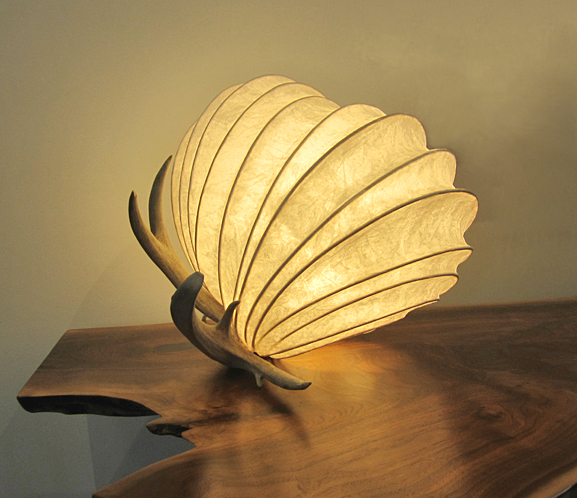 Red Lotus is a community of artists, craftspeople and designers, and is the design label for their commercial craft-art endeavor. Red Lotus was begun with the intention of nurturing a collaborative creative process, a system which recognizes not only the need for artistic endeavor on a personal basis but that also has a positive impact on a community, sustaining and supporting the development of mutual pursuits by establishing creative relationships based on craft-art. While Red Lotus has an economic base, it is not intrinsically about economics, and holds true that through collaborative connections, common values and aesthetics will be enhanced. It is based on the belief that a universal point is at the heart of the artistic creative process, crossing all boundaries; and that these creative experiences act as a teacher to all involved, both within and without. 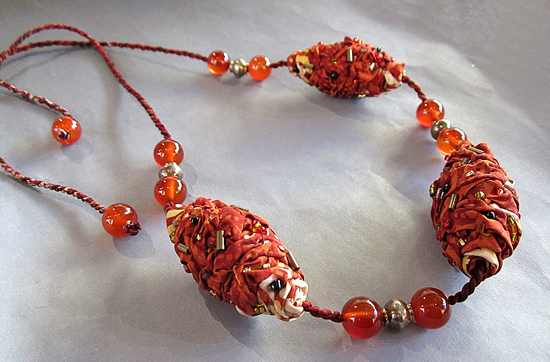 The artists of Red Lotus create beautiful items in the genres of textiles, wearable art, and jewelry; they are located in the areas of Yogyakarta, Java, and Ubud, Bali, Indonesia. 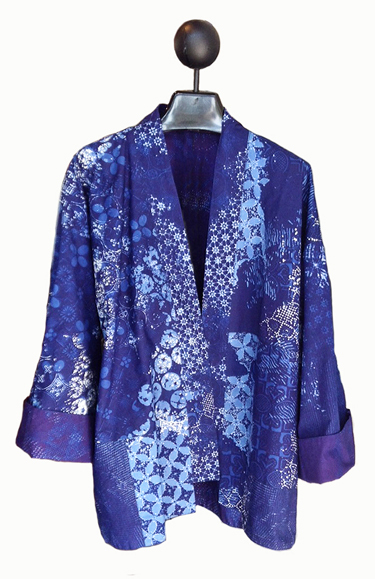 Gorgeous silk and cotton jacket, fully reversible, pieced with silk batik from ISNIA of Yogyakarta, Indonesia (hand-dyed, hand-batiked) in luxurious blues. Designer: Rana Helmi. One of a kind. For further information, please contact the Gallery. 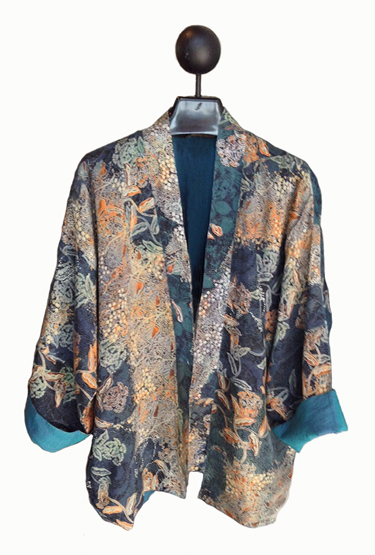 Lovely teal with splashes of golden orange, this short jacket is fully reversible, pieced with hand-dyed batik from Isnia of Yogyakarta. 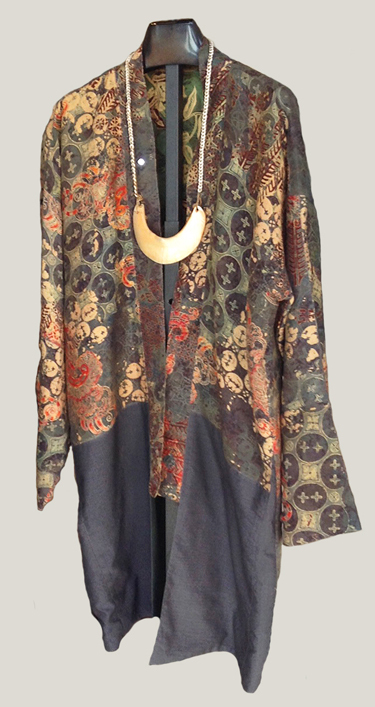 A special piece of wearable art, and absolutely one of a kind. Designer: Rana Helmi. For further information, please contact the Gallery.